Domotkanovo Tver province was conceived by the artist Serov as a place to create a solar portrait of a cousin. But the capricious weather liked to surprise suddenly overcast days. 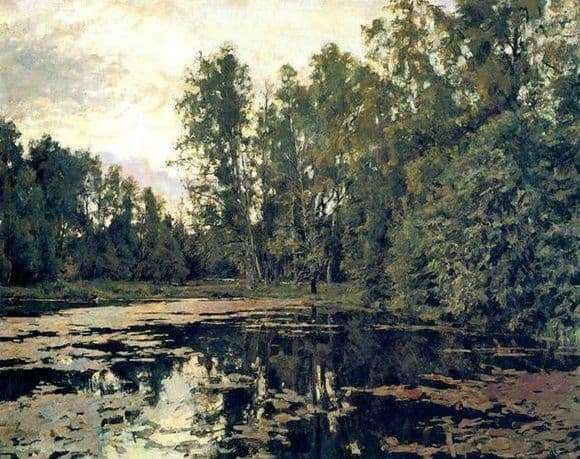 V. A. Serov ingeniously got out of the situation, having decided at the same time to write another canvas – “Overgrown Pond”. The landscape of 1888 came out expertly deep and detailed. “Overgrown pond” we see in silver, olive and marsh colors. The painter deliberately abandoned the bright colors and abrupt transitions. The palette of related tones soothes, fascinates and even lulls. The pond is shown as frozen: its slightest ripple has not touched its perfectly mirror smooth surface. The leaves of the brownish water lilies lined with islands of the entire body of water. On the shore grow lush alder trees, slightly painted with autumn yellowness. The picture is guessed later in the summer. The sun is already dimming, shyly hiding behind a cloudy shroud. The reflections of the faint gentle light on the leaves, the trunks of the trees, in the water make me feel the love of an abandoned but very beautiful landscape in its naturalness. Valentin Serov painted a picture that looked like a dream, a sweet slumber. Nature has blossomed and, having been satisfied with the hot sun, it prepares for immersion in autumn and winter dreams in order to wake up again in early spring, start a stir and, having washed with cool rains, blossom with all colors. From the artist’s canvas breathes mystery and significance. As a magnificent psychologist, Serov was able to paint the souls of people in their portraits. It is the same with nature, it is filled with a painter with a deep psychologism, an unknown and full of mysteries life. The condensed space of the “Overgrown Pond” immerses the viewer in the atmosphere of a forgotten forest, unrelated to the senseless city bustle. Now the canvas, magnificent in execution and emotional fullness, is deservedly exhibited in the Tretyakov Gallery.